Growers view pomegrantes at Kearney Nov. 29. 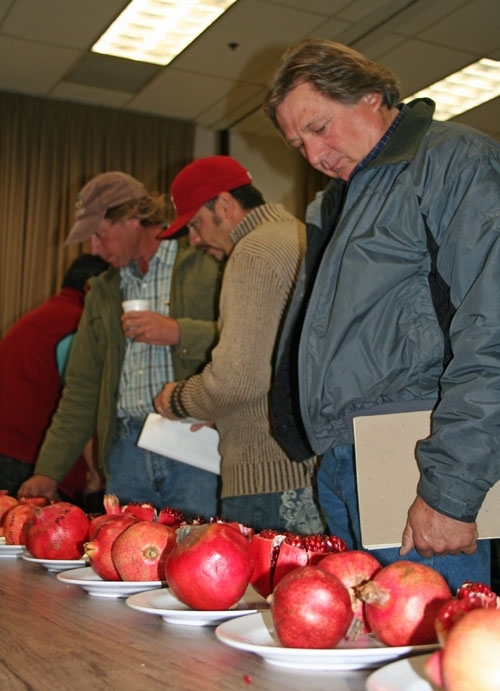 The growing interest in valley pomegranate production was demonstrated by a standing-room-only crowd of more than 130 farmers, pest control advisers and industry representatives at the San Joaquin Valley Pomegranate Meeting Nov. 29 at the Kearney Agricultural Research and Extension Center. UC Integrated Pest Management Program entomologist Walt Bentley opened the meeting with an overview of the crop's most serious insect pests. Bentley suggested growers focus on omnivorous leaf rollers and cotton aphids. 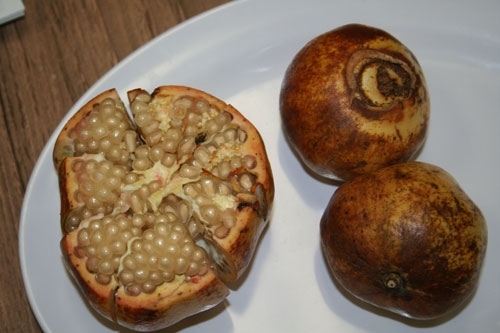 Ash whiteflies had been a pomegranate problem in the 1980s, until UC scientists introduced a natural enemy, encarsia, in 1991. "This was an amazing biological control success," Bentley said. Bentley admonished growers to protect the beneficial insects on their farms. "Ash whitefly will eat you alive if you take encarsia away," he said. Today, omnivorous leaf rollers are the key pomegranate pests. They move into the crop from weedy areas, feed on leaves, and unlike in grapes and peaches, will also feed inside pomegranate fruit. "If you're not monitoring for it with pheromone traps you're going to get stung and it will cost you money," Bentley said. He suggested traps be placed in orchards in February. Another important pest of pomegranates, cotton aphids, reduces crop yields and contaminates the fruit by excreting honeydew. Bentley described crop protection strategies for these pests plus ants, fork-tailed bush katydids, grape mealybug, false chinch bug, leaf-footed plant bug, citrus flat mite, navel orangeworm and filbert worm. Kearney plant pathologist Themis Michailides presented research results from his lab on black heart disease of pomegranates. Black heart is of particular concern because it causes no external symptoms; consumers who encounter the unappealing blackened fruit inside may be reluctant to try pomegranates again in the future. The research focuses on the identification of the fungus species that cause black heart, understanding the infection process, and developing procedures to manage the disease. Michailides has concluded that the main cause of black heart is Alternaria spp., fungi that are very abundant in nature and cause diseases in many crops. Further research was conducted to determine when infections take place in order to properly time the management application. 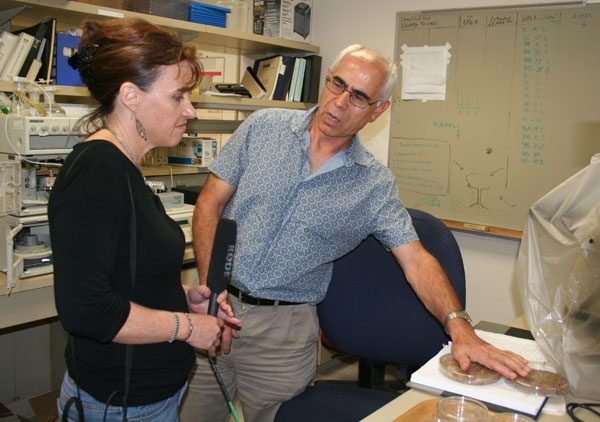 "We found that the 'Achilles heel' for infection by Alternaria is the open pomegranate flowers," Michailides said. "Amazingly, infections start at bloom, remain latent in the fruit and develop later in season as the fruit matures." 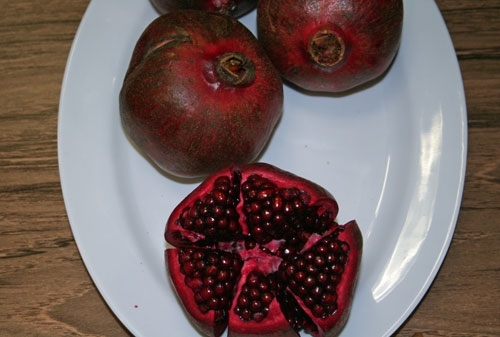 Jeff Moersfelder, the greenhouse/nursery manager and pomegranate point person for the USDA's National Clonal Germplasm Repository in Davis reviewed some of the pomegranate varieties the program offers to nurseries. The selections revealed arils (seed pods) with color ranging from pale yellow to inky red. He described sweet varieties that evoke cherry Slurpee and pineapple Lifesavers, and tart varieties with astringency akin to dry wine. Among Moersfelder's favorites are Parfianka, a well balanced, sweet-tart pomegranate with excellent grenadine flavor and soft seeds, and Ariana, which has deep red rind and dark red arils. 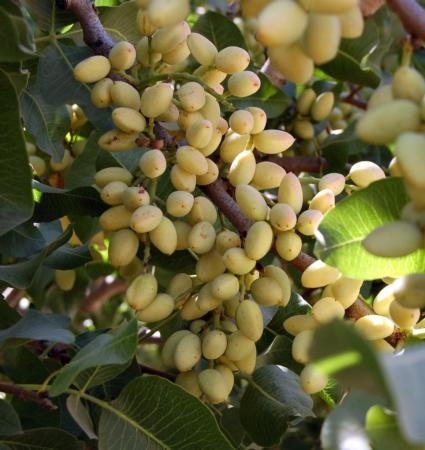 The darkest variety in the Davis collection is Kara-Gul, a cultivar from Azerbaijian. This variety, however, is more susceptible to heart rot. Moersfelder also characterized spice type pomegranates from the Western Himalayas, which are dried and used as condiments in Indian food, and ornamental varieties, many of which produce beautiful flowers but no fruit. The program closed with USDA emeritus researcher Claude Phené's description of a pomegranate irrigation, fertigation and nitrogen use efficiency trial under way at Kearney. Two trees in the trial are growing in the station's weighing lysimeter, a huge subsurface scale that allows scientists to determine exactly how much water a plant is using. The study aims to maximize water fertigation uniformity, improve nitrogen efficiency and minimize nitrogen leaching below the trees' root zone. The meeting was organized by UC Cooperative Extension farm advisors Maxwell Norton, Bob Beede, and Richard Molinar.